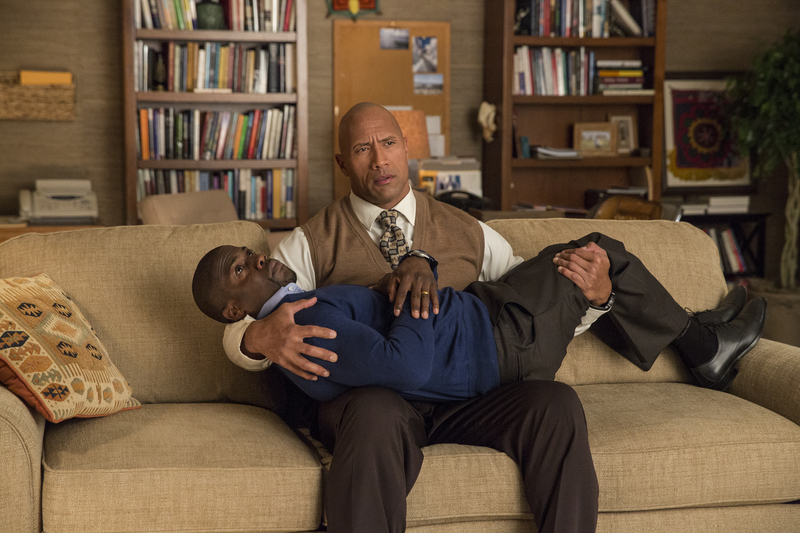 Bob Magnum (Dwayne Johnson) cradles Calvin Joyner (Kevin Hart) in CENTRAL INTELLIGENCE. ©Warner Bros. Entertainment. CR: Claire Folger. 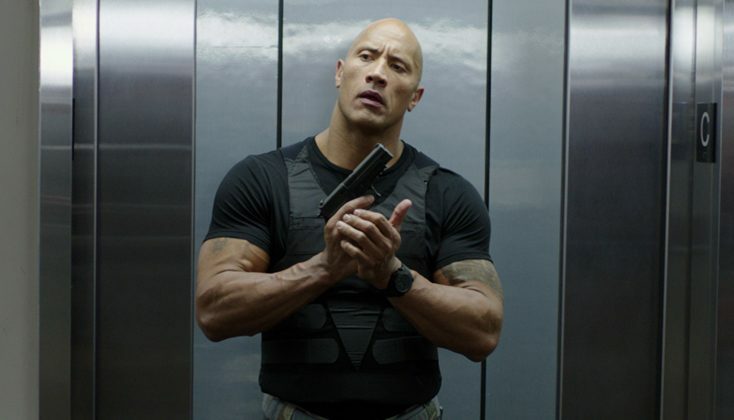 NEW YORK—Professional wrestler turned actor Dwayne Johnson has proved in recent years he is equally adept at comedy and action. The imposing, muscular star gets a chance to do a little of both in “Central Intelligence,” in which he co-stars with comedy giant Kevin Hart. Johnson, who used to be known as “The Rock” but now is affectionately known to his friends simply as “D.J.,” says the project was fun to do. The story follows a one-time bullied geek, Bob (Johnson), who grew up to be a hardened CIA agent. He returns to his hometown for his high school reunion. Claiming to be on a top-secret case, Bob enlists the help of former “big man on campus” Calvin (Hart), now an accountant who misses his glory days. But before Calvin realizes what he’s getting into, it’s too late to escape, as his increasingly unpredictable former classmate drags him through various shoot-outs, double-crosses and espionage that could get them both killed. Calvin starts to doubt whether Bob is all he presents himself to be or if is he harboring some dangerous, dark secret. “Central Intelligence” also stars Oscar nominee Amy Ryan (“Gone Baby Gone”), Aaron Paul (AMC’s “Breaking Bad”) and Danielle Nicolet (BET’s “The Game”). Rawson Marshall Thurber (“Dodgeball: A True Underdog Story”) directs the action comedy from a screenplay he wrote with “The Mindy Project” writers Ike Barinholtz and David Stassen. The towering, amiable actor spoke at a press conference about why “Central Intelligence” resonated with him and working alongside Hart. Q: What was it like working with Kevin Hart? Johnson: I was impressed with Kevin. I was following him on social media before we met, before this movie came about. When we had our very first meeting, I told him that I was impressed with him. The success is one thing but he also makes people feel good. It’s just a cool thing to make people feel good and to make them laugh. But he also works very hard. That was something I really appreciate about him. For a star at his level, because he’s a massive star, and often times, when you get around other stars, it’s not as easy and as free. There’s sizing up and comparing yourself to other actors. When I met Kevin, he said, “I want to go global. Take me with you.” He literally said that, “Take me with you. Let’s do it together.” And I was like, “Great!” All jokes aside, I can’t say enough great things about the guy. Q: What were you like in high school? Johnson: In my freshman and sophomore year in high school I spent a lot of time trying to get back on the right track. I was arrested multiple times by the time I was 16 so I had a little harder time trying to adjust, like a lot of us do during high school. It wasn’t until I got involved in sports, athletics, that it gave me a focus and a reason to do the things I was doing. By the time I was a senior I ready to go to college—I was lucky I got a full scholarship—I was the only one in my family that got to go to college. I was very successful by the time I left high school. I went to the University of Miami and won a national championship. Then, when I was 24, I was the youngest WWE wrestler. Q: One of themes of “Central Intelligence” is that high school shapes the adult you become. How did high school affect you? Johnson: I think high school years are defining for everyone. You’re coming into adolescence. That’s where you start to be defined and start to understand yourself and who you are and, hopefully, accept yourself. If you’re like me, it takes a little while to accept yourself. Being the big man on campus and then getting out (in the world) and then 10 or 20 years later wishing you were someone else. You’re not quite happy with all the things around you. Often, much later, something can happen in your life, an anchoring moment years later where you realize, I’ve got it pretty good. I’m blessed. I’ve got a lot of good things. Q: How did you get along? Johnson: When Kevin and I sat down with Rawson (Marshall Thurber, the director), we talked about embracing who you are and understanding the blessings you really do have. You can lose track of that when you’re on the treadmill of life. Things are going so fast but sometimes you have to slow down and look around. Kevin (Hart) and Rawson made it easy. We just went and played and had fun. Q: Have you worked with actors that have been difficult to work with in the past? Johnson: (laughs) You can imagine. Q: Were you ever bullied in school? Johnson: I wasn’t bullied in high school but I was bullied in junior high school. There was an incidence that happened where I thought I was fighting one kid and then I got jumped by a gang, but I stood up for myself. I was 11 years old; he was in high school. I hit that kid so hard after he bullied me all summer at summer camp. After I hit him, I ran home so fast that I ran out of my shoes. When I got in the house my mom said, “What’s going on? Where are you shoes?” And I said, “Oh, I left them at camp.” So she made me get in the car and drove me back to the camp and then told me go find (the bully) work it out with him. What she was trying to teach me is that if you get into a situation like this, don’t run away, you have to stand up for yourself and communicate. It was a good life lesson. Q: Was it challenging to balance the comedy with the action in the film? It’s also a mystery whether you’re a good or bad guy. Johnson: Rawson was like let’s try to make people believe that you may be a bad guy. You could be the villain they’re after, the Black Badger. Q: What was your favorite scene? Johnson: It was in the doctor’s office where we play the soul gaze/slap game. You can’t look away or you get slapped. I could not stop laughing. You see that in the outtakes (at the end). That was Day 1 (of shooting). With you wife or girlfriend or husband, or whoever it is, play that game, soul gazing, where you can’t look away and you can’t talk. Anyone who looks away, boom. I’m telling you, you’ll love it. Johnson: We’ve partnered up with HBO’s Sheila Nevins and my company, Seven Bucks Productions. It’s going nicely. We have a documentary called “Rock and a Hard Place.” There’s a very special boot camp prison in Florida that has a high success rate. It’ll be coming out either this fall.